The Royal Scots Dragoon Guards (Carabiniers and Greys) (SCOTS DG) is a cavalry regiment of the British Army, and the senior Scottish regiment. 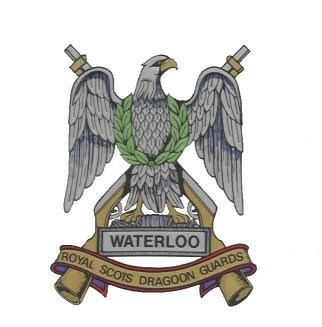 It was formed on 2 July 1971 at Holyrood, Edinburgh, by the amalgamation of the 3rd Carabiniers (Prince of Wales’s Dragoon Guards) (themselves the product of the amalgamation in 1922 of 3rd Dragoon Guards (Prince of Wales’s) and 6th Dragoon Guards (Carabiniers)), and The Royal Scots Greys (2nd Dragoons). The regiment has won numerous battle honours and two Victoria Crosses, and, through the Royal Scots Greys, is the oldest surviving Cavalry Regiment of the Line in the British Army. The regiment is currently based in Fallingbostel, British Forces Germany, as part of the 7th Armoured Brigade (’The Desert Rats’).